The generic Save command is Ctrl+S. The command to close most windows is Ctrl+W, although often the weirdly obscure Alt+F4 is needed. Up pops the Start menu thing. At this point, things are different between Windows Vista and Windows XP. If you use Vista, go to Step 3; for XP, go to Step 5. In Windows Vista, click the right-pointing triangle next to the padlock icon. A pop-up menu appears with various shutdown options, as shown here. Choose the Shut Down menu item. The laptop turns itself off, and you can skip the remaining steps—you’re done! 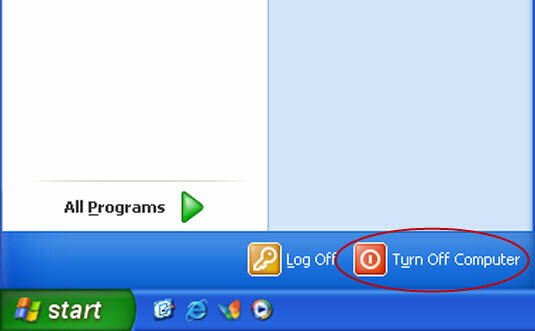 In Windows XP, click the Turn Off Computer button. A colorful Turn Off Computer box-thing appears, as shown here. The laptop turns itself off. Yes, that’s correct: The laptop turns itself off. When the screen goes dark and the power lamp is dimmed, you can shut the laptop’s lid and put away the laptop. Note that Windows XP offers you a Cancel button (refer to Step 6 above) so that you can change your mind before shutting down. 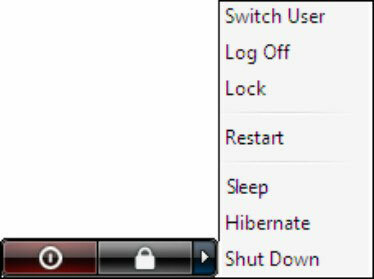 In Windows Vista, choosing the Shut Down menu item immediately shuts down the computer — unless: when you still have unsaved files, first, you didn’t follow all the instructions, and, second, you have an opportunity to save them before the laptop shuts down.